Mallory Thompson appears to have it all -- a loving husband, wealth, and a beautiful home . . . but appearances can be deceiving. Mallory has been on the receiving end of emotional, psychological and verbal abuse from her husband, Dr. Michael Thompson for a number of years. He has told her what to wear, sabotaged any possibility of her having a job, and made her daily life a living hell. Even after their "separation" he continued to demean her by bringing women into their home and expecting her to continue to provide for him as part of her wifely duties. Mallory finally decides to leave Michael after he hits her, but she has nowhere to go and is afraid for her safety. Luckily, the only friend she has, Luke Carson, comes up with a plan and takes her to his family in Kentucky. Mallory is quickly made to feel at home in Kentucky. Luke's family opens their arms and home to her and she quickly finds enjoyment in the simple pleasures of life. In a short period of time Mallory has learned to overcome her fear of dogs and befriends Peanut (a three-legged rescue dog). She also learns what it's like to be a part of a family for the first time in a long time. Kentucky Home is a contemporary story that blends just the right amount of romance with self-discovery not to mention humor. Mallory learns to fight for her freedom and begins to build a new life for herself in Kentucky. I found all of the characters, even the bad guy, to be well-developed and realistic. The simple rural life that Ms. Title provides is an excellent backdrop for the action within the story. Running a business is difficult work in these current economic times and this isn't downplayed whether it's the veterinarian's business or the stables. It was nice to see Mallory grow in strength of mind and purpose. Good food, good friends and a simple life provide Mallory with the foundation she needs to learn to appreciate who she is and what she wants out of life. 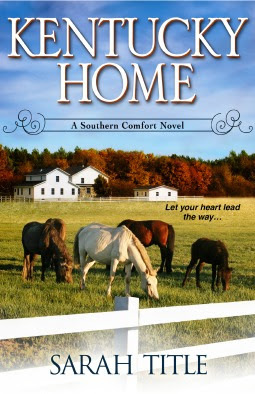 Kentucky Home is a well-written contemporary romance that you don't want to miss. I found this to be a fast-paced read that provided just as many smiles from the humor as it did sizzles from the romance. I look forward to reading more from Ms. Title and the Southern Comfort series. Disclaimer: I received a digital copy of this book free for review purposes from the publisher via NetGalley. I was not paid, required or otherwise obligated to write a positive review. The opinions I have expressed are my own. I am disclosing this in accordance with the Federal Trade Commission's 16 CFR, Part 255: "Guides Concerning the Use of Endorsements and Testimonials in Advertising."